For the first time in quite a while, a new comic with interior art by me is out! The Harley Quinn Road Trip Special–a madcap romp across the USA with Harley, Poison Ivy and Catwoman sharing a vintage 1967 Airstream Trailer, and pulling it with a 1960 Thunderbird. Due to the untoward vicissitudes and capricious communication customs of modern comic book production 😉 I was only able to draw part of the book, but there are more comics on the horizon–I will keep you posted! 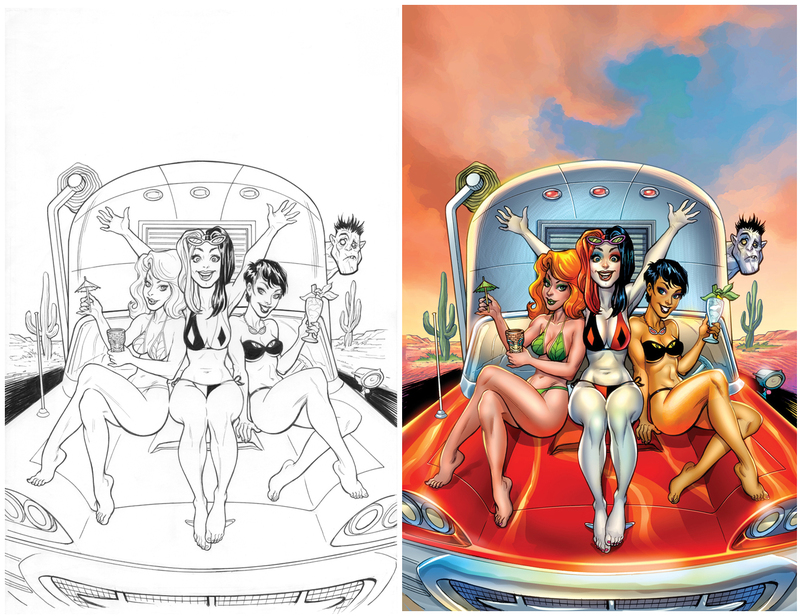 Here is the line art of my variant cover, along with the published version with color by Paul Mounts—enjoy! Hi bret, that cover really awesome so awesome I had too get two. Are you going to be making an appearance at stan lee’s comikazie expo this year? Awesome work! I love it. I hope I can find the variant cover.